Chop Chop! Let’s get moving kids! The magic number is 150! WE HEAR YOU… LETS TALK! A Modern Day Medical Detective! An Immune Deficit is a pathology whereby one or more components of the immune system is either missing or dysfunctional, resulting in a higher susceptibility to infections. To know more about this group of diseases and the treatments, listen to Dr. Elie Haddad’s 8 minute presentation. (Click on the image or the text to link to the video – french version only). Dr. Haddad is Director of the Immunology, Rheumatology and Pediatric Allergy department of the CHU Sainte-Justine. 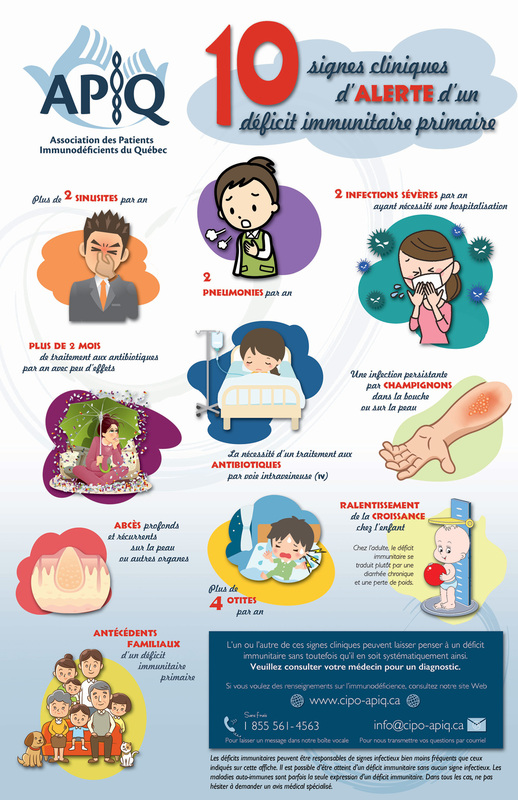 The mission of the « Association des Patients Immunodeficients du Québec » is to improve the HEALTH and QUALITY of LIFE for people with immune deficits.